There are two different concepts that require a bit of clarification here- Time-Travel(as the name suggests) and Space-Travel(that is travelling through large distances in a relatively short time). In this post, I’ll focus more on space travel. Einstein’s Special Theory of Relativity(there’s no need to know more than the name here) seemed to have imposed a serious constraint on our ability to space travel. And, since we cannot travel faster than light, that would imply 8 years if we tried to travel near Proxima Centauri(the other star that is closest to us). And 80 years to the galactic center. I seriously doubt we would find any volunteers for this. That should, however, not dampen our enthusiasm about Space-Travel. A small thought experiment is worthwhile here(the same Einstein used to do). Alright, so if I asked you what is the smallest distance between two points on a surface, you would most probably answer: “that’s pretty simple, it’s a straight line between these two points!” At this point, you would probably want to laugh at my stupidity. But, I would then humbly answer- ‘Nope’. You see, this straight line is the same restraint that the limit of light imposes on us(and prevents us from finding any volunteers). The answer is to warp the surface. You fold the surface(like a paper) so that the two points touch or are aligned to each other and Ta-Dah!, away goes all the limits that once existed. Distance is annihilated. This also implies the possibility of space-travel. 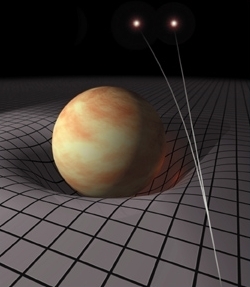 This warping of space is real-physics(we’ve all heard about curved spacetime!- that was what made Einstein so famous).We can actually observe this when light ‘bends’ a bit as it travels close to the sun-‘Gravitational Lensing‘(just another name) caused by the sun’s mass. (shown on the picture). Remember how the rocket from Apollo 13 was rescued by going round the moon. Same stuff. What we just need now is to ovecome the energy constraint of several billion billion(and many more billions) Terajoules. No hard stuff! Space-Travel, Time-Travel and Wormholes sound pretty fascinating when related as such but all these are still pretty much virgin territory. You wouldn’t find many researchers working on Time-Travelling because of all the ethical issues that are portrayed in Steven Spielberg’s “Back To The Future”(that’s what the “spacetime-continuum” dilemma that “Doc” continuously rambled about in the movie). But science has “a way” of doing things and who knows what may happen? Who could have guessed there would be people reading a blog about space-travel written by a deranged blogger who thinks “science can be fun”. Mom: Alice, can you go to Pluto and bring me those delicious Plutonian-flavored ice cubes. Alice: Not again, Mom! I went there just yesterday.Besides, there are still some ice-cream left in our fridge on Mars. Mom: Alice, this is for your Grandma. I want you to go to 1960 and give it to her. Alice: Mom, Time-Travel makes me sick! Alice: Okay, okay, I’m going! For anyone interested in deeper “Travelling”, I suggest reading Stephen Hawking‘s lecture. “We are just an advanced breed of monkeys on a minor planet of a very average star. But we can understand the Universe. 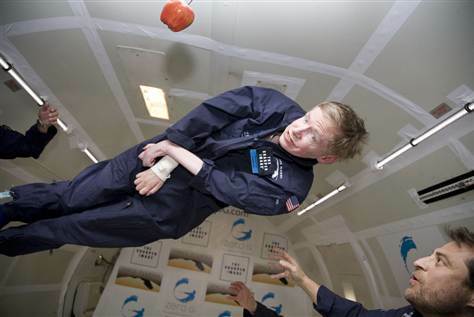 That makes us something very special.” Stephen Hawking.